Joint stock company "Radviliskis machine factory" is one of the biggest agricultural machinery and metal processing factories in Lithuania. The Factory was established in 1949. We project and produce a various types of agricultural machinery, technological lines, equipment, spare parts and other metal constructions by orders. We produce agricultural technique: straw shredding and pellets production equipment set SSGL, pellet press OGM - 1,5A, semi - suspended corn harvester JK - 3, combine of picking berries, seed treater SBI-1, grain crusher, fertilizer spreader, mowers and etc. Additionally, we make car trailers, spare body parts for "VAZ - LADA" cars. The factory has a possibility of carrying out all metal treatment technological processes. High quality giving for our products and service is main activity indicator in the factory. Our products correspond to EU standards. 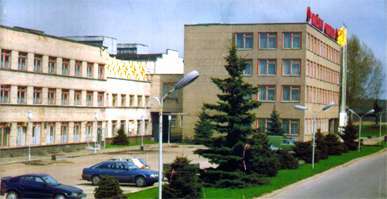 The factory is based in the central part of Lithuania, by the highway Panevezys - Siauliai. Radviliskis is the biggest railway junction in the Baltic countries. Siauliai airport is - 18 km. and Klaipeda seaport - 200 km. away. The production of the factory is sold in Lithuania, Latvia, Estonia, Finland, Italy, Germany, Denmark, Poland, Bulgaria, former Soviet Union. A solid team of 100 high quality our company specialists is always attentive and open to cooperation with new clients, customers and suppliers.